The debate over whether you should snack at all shows no sign of dying down. But there’s no evidence that snacking either helps or hurts weight loss in the abstract, so the most reasonable approach is to just do what works for you. If you’re not a snacker, you can close the tab now. 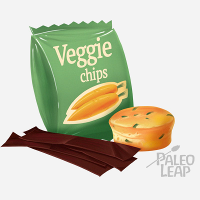 But if you are a snacker – or if your kids are – then finding Paleo snacks can be hard. Most of them revolve around nuts, dried fruit, and sugar substitutes like honey and maple syrup. For some people, those foods are completely fine, but for others they tend to trigger overeating, further sugar cravings, or eating out of boredom just because you have treats lying around, instead of eating because your body is hungry. [P] = contains a notable amount of Protein. [F] = contains a notable amount of healthy Fats. [L, P, F] Hard-boiled eggs with salt and pepper. One or two hard-boiled eggs makes a great snack to tide you through the afternoon – go deviled if you really want something fancy. [L, P, F] Prosciutto or another cured meat, like salami or summer sausage. You’ll have to watch out for junk ingredients here, but you can often get high-quality products with just meat, spices, and salt. 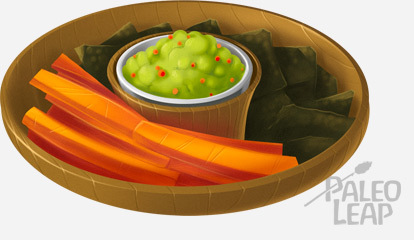 Fresh vegetables with guacamole: easy to throw together and full of healthy fats. [F] Vegetables with guacamole. Grab some pepper strips, baby carrots, cucumber slices, or other favorite vegetables and dip them in a bowl of fresh homemade guacamole. [L, P, F] Beef jerky, either store-bought (watch out for junk ingredients, though!) or homemade (scroll down to the bottom of the page for the recipe). In high-end grocery stores, you can even get salmon or turkey jerky for a nice change of pace. [L] Rainbow carrots. Rainbow carrots are the fun multicolored ones you see in bunches – they’re great for kids because they’re fun to eat (and all the colors taste just like normal carrots). Eat them plain, cut into strips or chips, and/or with your favorite dip. [L, P, F] Can of sardines, tuna, or other fish. Canned fish will keep almost indefinitely in your glove compartment or at the bottom of your gym bag; throw a couple tins in there for emergencies and you’ll always something to lean on. [L] Kale or other vegetable chips. Kale chips are easy to roast up in advance, and you can flavor them however you like. [P, F] Egg salad in celery sticks or cherry tomatoes. This one is a little more involved, but great for weekends or playdates. Whip up a batch of egg salad and use it to fill in the channel in celery sticks, spoon it into cherry tomatoes, or just eat it as a dip for any other vegetables you like. Bonus: small amount of leftover anything. Any Paleo leftovers can be a snack if you eat a snack-sized amount. Leftover kabobs? Just have one instead of the 2-3 you’d normally eat at a meal. Extra pork chop? Grab half of it and throw a tablespoon of sauerkraut on top for some crunch. If you’re thinking something like “…but none of these are snack-y. Where are the coconut date balls? Where are the Paleo cookies?” – well, that’s the point! This is a list of snacks to give your body energy, not snacks that you eat for fun. If treats based on nuts and dried fruits work for you personally, that’s fine, but they’re not right for everyone, and even the non-treat-eaters need something to eat when they get hungry in the middle of the afternoon. What’s your favorite savory snack? (Bonus points if it provides some protein and fat to keep your energy high for a while). Let us know on Facebook or Google+!